The holidays may be over, but a brand new year is just beginning! Discover all the potential and possibility of 2017 at Mesa Bookmans. This is the perfect time to set ambitious resolutions, try unfamiliar things and reevaluate lofty goals. But remember to put that special someone first – YOU! We celebrate Jan-YOU-Ary by helping you get motivated, all throughout Jan-YOU-ary, we want to encourage you to get out and try something new!#TreatYoSelf! How can we help YOU? 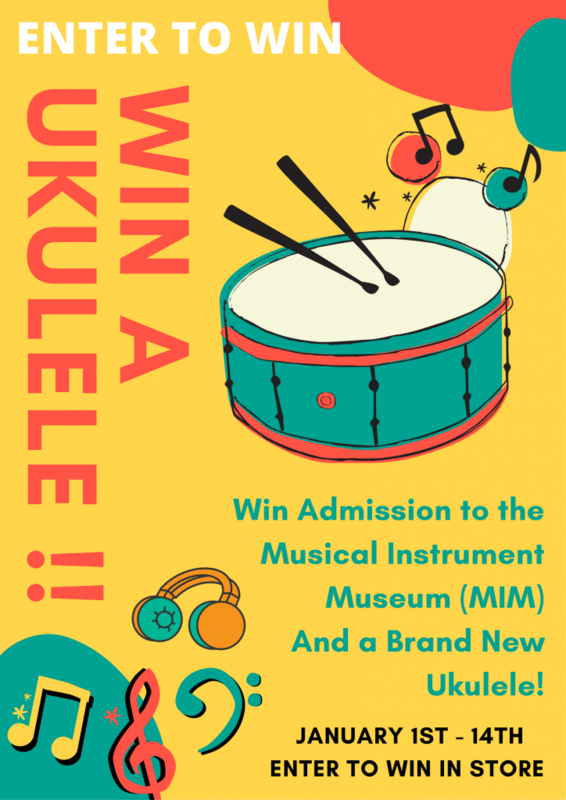 Stop in Bookmans Mesa anytime between NOW and JanYOUary 14th and enter to win Admission to The Musical Instrument Museum (MIM) and a Brand New UKULELE! One lucky winner will win both! MIM displays more than 6,500 instruments collected from around 200 of the world’s countries and territories. Most displays are enhanced by state-of-the-art audio and video technologies that allow guests to see the instruments, hear their sounds, and observe them being played in their original contexts—performances that are often as spectacular as the instruments themselves. Guests are introduced to MIM through the Orientation Gallery on the first floor, which showcases the artistry, diversity, and movement of musical instruments from around the world. On the second floor, guests can venture into different regions of the world to discover the complete orchestra of a Chinese opera, a big-band jazz ensemble, or all the instruments of a mariachi band, among other things. Wireless “hot spots” around MIM provide loops of streamed music, immersing guests in the sounds of musical instruments. Guests are given wireless headsets to wear throughout the museum. As they approach each display, they will hear music and see the instruments being played on high-resolution flat screens. The wireless audio system is user-friendly for guests of all ages. The Ukulele is a fine instrument made by Amahi Ukuleles, brand new, and comes with its own bag. Its tuned and ready for its first user! Could this be you? Also, be sure to keep a handle on our free events all year round! There’s always something unexpected going on at your favorite Bookmans Location. Check out our Events Calendar for all the details. #TreatYoSelf!